Pegg Thomas's debut is a fantastic read! I'm hoping she'll win some awards with this as a debut Christian fiction writer! Alannah Fagan escaped from a battle she wouldn’t survive. Stewart McCann left behind a battle he couldn’t face. Thrown together at Horseshoe Station, can they find something worth fighting for? I loved this story. The imagery of the setting. The way Pegg Thomas conveys her story, the words she uses, i.e., her "voice" really resonate with me and are perfect for the story she tells. The characters are well-developed and feel crisp and clear. I found myself rooting for all the "good guys" and praying for the villains to get their comeuppance. This is a richly layered plot in a standard length novella of about 20,000 words. Although it is the last in the collection, you could read it first as the novellas aren't connected to each other they are stand alone novellas. 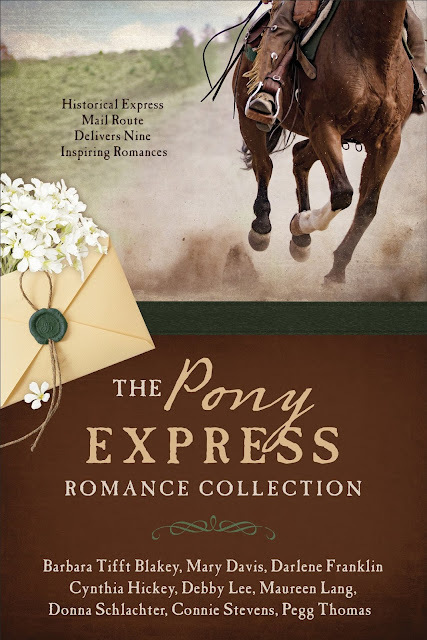 GIVEAWAY: We're giving away two copies of The Pony Express Romance collection this week! So be sure to comment on Pegg Thomas's interview on the previous post, too! For this copy to enter answer the following question -- What about the Pony Express intrigues you? Aww... thanks, Carrie. :) I'm glad you enjoyed it. Loved your story and got to read Cindy Hickey's too! Looking forward to more of your writing!!! January is my Colonial story, "In Sheep's Clothing!" That one is completely different from "Embattled Hearts." If I'd have tried, I couldn't have written so such opposite stories. The Pony Express intrigues me because how fast they rode to get the mail across this country, with no protection during a time that could be very dangerous to them. Not only that, in all kinds of weather they were out there be it hot or freezing. Thank you for the chance to win a copy of "The Pony Express Romance Collection", I love these books! Yes, it was a dangerous job. That's why the Pony Express preferred to hire orphans. Hi Wendy, wow, I think it had to have been super dangerous and scary. Can't imagine my boy being out in that! Melanie, This is a great read for your Book Club in Texas hint hint!!! There were no "snowflakes" back then, that's for sure. Hi Cathy! I love PEGG's comment about the "no snowflakes" back then lol! The fortitude of the riders is amazing. The courage of the riders to go through some dangerous areas. Indians, outlaws, storms, accidents ... they faced it all. The riders courage and strength not to mention their dedication. Especially when you consider that most were only in their teens. I can't imagine riding that far and by myself, along with all the dangers out there. What intrigues me about the pony express is the horses and the age of the riders. Hi JENNY! I was SHOCKED to read in PEGG's story about the young teens and preferring orphans. So sad! Most of the horses were mustangs, born and bred to the country they'd have to run across. JENNY you won a copy of PEGG THOMAS's debut release! Congrats! The danger and commitment of the Pony Express fascinates. Imagine being a Pony Express rider who survives all that and what their later life was like. I wish there were more first-hand experiences from the Pony Riders recorded. Woefully, there are almost none. I learned to ride a pony at a friend's house when I was just a youngster, and since then the idea of riding very fast across the country has just fascinated me. There is something about the freedom and perhaps even the danger that just intrigues me. I don't know exactly what intrigues me about the Pony Express, I just like that period of history. Nothing wrong with being a history geek. Trust me! How the mail ran back then...an intriguing era in history! I love the looks of this collection and that cover is gorgeous :-) Thanks for the review & giveaway chance. I think Barbour outdid themselves with this cover. Agreed! I've always been intrigued by how fast they rode across the country. Other than the dangers they faced, I wonder what they were thinking about during their rides. Did they hope to save enough money to start a different life? I meant to say Thanks for the Giveaway! I'm using a different computer and deleted part of my own comment. Sorry. I'm not used to having a touchpad. Congratulations again Pegg on your story! Real interesting. I have read books before that talked about the Pony Express. It's sad though that they knew it was dangerous enough to want to hire orphans. I would have never had the courage to do that job. But thankfully some people did it and delivered lots of mail. I know some were killed but some liked the rush I guess to do a dangerous job. Every thing in history intrigues me. Debra E. Marvin -- Heroine Susannah Kimbell & Giveaway!